Unfortunately time constraints (i.e my day job) keep getting in the way of me updating this site so all Ive been able to do so far for the Liverpool Nickname page is a very basic bit of background. 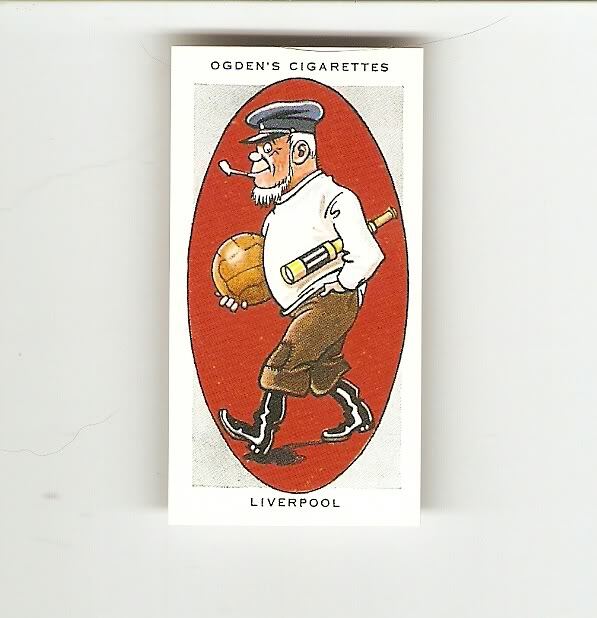 Ive shown below a football cigarette card from the Ogdens AFC Nicknames series that shows a caricature that depicts a "Sailor", which is a reference to the fact that they were apparently once known as "The Mariners" due to the fact that Liverpool was once one of Englands busiest ports. "It rarely happens that a split in a football club can be considered fortunate, but if the members of Everton had not fallen out it is unlikely that there would have been a Liverpool club. When Everton went to Goodison Park the minority formed another club which was named Liverpool, and they continued to carry on at the Anfield ground. This was in 1892, and they have since gained many fine successes as members of the First Division, having won the Championship on four occasions. But they will never be content until they have also carried off the Cup. They are known as the “Reds” and sometimes as the “Mariners”, Liverpool being one of our chief ports. ". So, thats all Ive done so far but dont worry I will be coming back to this page to expand on this particular football nickname a bit more ! !